With a rapidly aging population, maintaining cognitive and physical vitality is the key to quality of life, and reducing personal and economic burdens on our society. Current clinical and epidemiologic studies provide fair amount of evidence about the relationship between risks for developing cognitively affecting diseases and factors that increase or decrease those risks. Incorporating such knowledge into your daily life will help you maintain your cognitive and physical vitality as you age. Although more comprehensive research is needed, current clinical and epidemiologic studies provide solid evidence about the relationship between risks for developing cognitively affecting diseases and factors that increase or decrease those risks. Incorporating such knowledge into your daily life will help you maintain your cognitive and physical vitality as you age. The brain is the command-and-control center of your life. There are many medical conditions that cause memory loss or other types of cognitive decline. Cognitive decline from normal function is often described as mild cognitive impairment (MCI) or, in more severe cases, dementia. These terms do not refer to specific diseases, but rather, to stages of severity along the continuum of cognitive decline. The dementia stage is further divided into mild, moderate and severe stages. MCI and dementia are caused by some underlying disease or condition. There are many diseases and disorders that can lead to MCI then to dementia, including Alzheimer's disease (AD), stroke, Parkinson's disease, Frontal lobe disease, head trauma, certain vitamin deficiencies, hormone deficiencies, metabolic and organ diseases, and depression. Alzheimer's disease (AD) accounts for approximately 50% of all causes of cognitive impairment. AD predominantly afflicts those over the age of 65. In 1900, the average life expectancy was 47 years, so AD occurred rarely. Since then, life expectancy in the United States has dramatically increased driving up the incidence of AD, and socioeconomically affecting our society. Hebert LE et al. 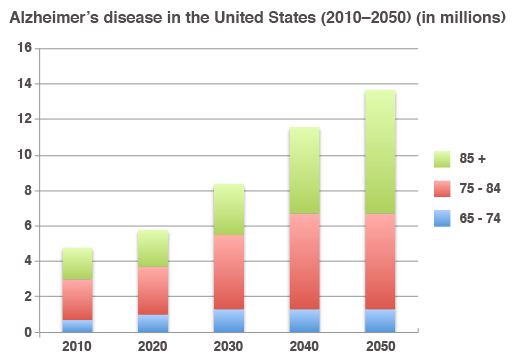 Alzheimer disease in the United States (2010-2050) estimated using the 2010 census. Neurology. 2013; 80(19): 1778-1783.